Morocco is a country known for its vibrant warmth and richness. Its very essence surrounds the senses with earthy hues, sumptuous woods and seductive aromas. At the heart of this complexity is thuya, one of the regions most rare and precious woods. 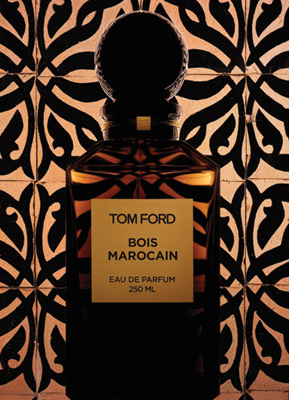 Introducing PRIVATE BLEND BOIS MAROCAIN. With the rich essence of the root from the mystical thuya tree, it releases a scent so intense and mysterious it seems to reveal the secrets of the earth. Offering some of the finest and rarest ingredients, this scent possesses nine superbly intensified orpur naturals and a selection of the highest grade raw materials chosen by a team of master perfumers. The top notes are a mélange of Madagascan black pepper, cypress and bergamot that provide fresh peaks and sparkle to balance its darkly refined opulence. Baies rose orpur delivers a spiced floral vibrancy, while the smooth heart of the fragrance, thuya, drenches the skin like molten gold. Nutmeg and davana enhance the ambrosial sensuality of the scent. An enduring base blends the textures of different cedar essences: cedar atlas with Indonesian patchouli orpur penetrates the skin and mixes with exotic facets of incense, patchouli and earthy vetiver to leave a lasting impression. The new scent will be offered in the original PRIVATE BLEND packaging inspired by the dark brown glass colouring of the apothecary bottles used in perfume laboratories. The 50ml flacon is created to be weighty on the hand and has the sleek architectural look of a chess piece. The 250ml decanter is carved with the highest level of craftsmanship.